Believe it or not, the cooler days of autumn will soon be here, and our guests will be asking about the best time to see the fall colors in the Hot Springs, AR, area. The “experts” say that our area will hit “peak” color in early to mid-November. 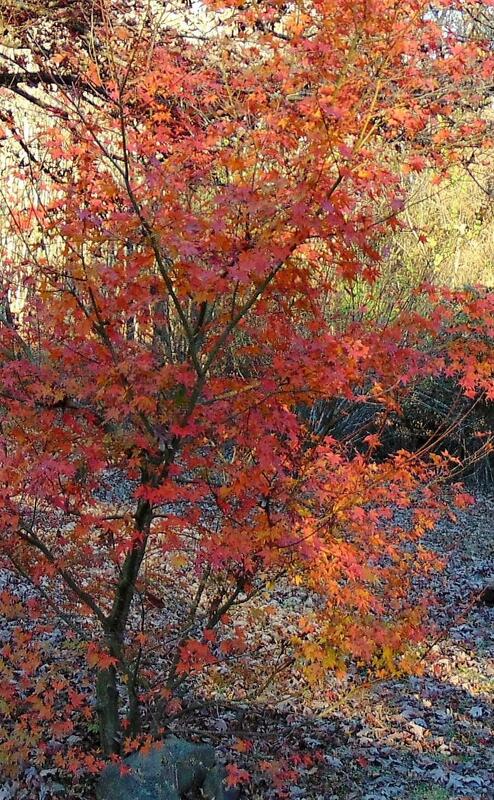 We’ve seen a few Japanese maple trees turning already, and suggest anytime between mid-October to Thanksgiving will be a great time to visit our area. Where can you see the best color? One of our favorite fall places is Garvan Woodland Gardens. With 4 1/2 miles of wooded shoreline along Lake Hamilton, this botanical garden offers an amazing display of colors. There are formal garden areas blooming with mums, fall bulbs, and roses; the Garden of the Pine Wind with Japanese maples in fall splendor; and natural forest interspersed with camellias, holly, and fall foliage. Spend two nights with us and enjoy our Unplug and Unwind package. Relax and recharge with 2 tickets to Garvan Gardens, a spa basket full of locally made soaps to enjoy in your jacuzzi tub, and breakfast at Tiffany’s each morning of your stay. If you’re feeling a bit more adventurous, bring your bikes and watch the colors breeze by on one of three IMBA Epic Rides in our area. Tiffany’s Bed and Breakfast is the perfect choice for your Hot Springs, AR, area lodging. We are centrally located within 25 miles of Iron Mountain Trail, Lake Ouachita Vista Trail (LOViT), and Cedar Glades Trail. The much anticipated grand opening of the Hot Springs Northwoods Trail System will be celebrated November 17 – during peak color! If you want to double your Hot Springs fun quotient, view the beauty of fall while attending the Hot Springs Documentary Film Festival Oct. 19-27. The oldest all-documentary film festival in North America’s 2018 categories include U.S. and International short and feature documentaries, Southern Stories, Sports, and Films made in Arkansas. Celebrity guests and the screening schedule will be released soon. All-access passes ($400) and single tickets ($12) can be purchased online, as well as the schedule, which should be released by 10/1/18. This entry was posted in Events, packages, things to do in Hot Springs and tagged Fall color, Garvan Woodland Gardens, Hot Springs Documentary Film Festival, mountain biking in Hot Springs by admin. Bookmark the permalink.